Chefs Choice Meats is a leading Melbourne based company designed specifically to service the hospitality industry through out Australia. With more than 60 years of experience in the food service and meat industry our expertise in all categories of Beef, Veal, Lamb, Pork, Poultry, Smallgoods and Game meats means that our primal and carcase selection, further processed primal and portioned meats and value added lines provides our growing client base with consistent product giving greater diner satisfaction. Our fleet of registered vehicles are fully insulated and refrigerated and cover the Melbourne metropolitan area 6 Days a week. Chefs Choice Meats is leading the way by providing detailed pantry lists to make ordering a breeze and computerized picking lists which enable you the customer to apply exact product specifications ensuring you receive what you want when you want. 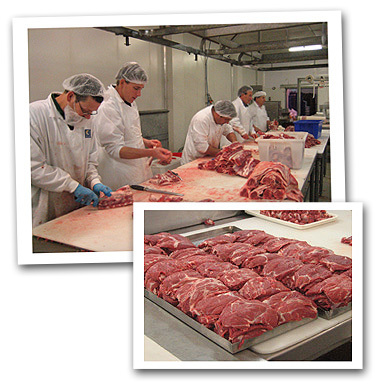 Chefs Choice Meats has also achieved accreditation for our quality assurance program from Primesafe Victoria which incorporates a strict HACCP program and is also accredited from the Halal Certification Authority – Australia for our Halal program.